Estimated to launch in June of 2014, Arsalun Tafazoli and Nathan Stanton of CH Projects - a San Diego-based powerhouse hospitality collective with eight distinct concepts in its repertoire (Craft & Commerce, Polite Provisions, Underbelly, Neighborhood, Noble Experiment, etc.) - will introduce a contemporary take on the conventional juice bar experience. Just last week, a lease was signed on a 1,100 square-foot space located at 871 G Street. Formally occupied by Venissimo Cheese shop before they moved over to The Headquarters, the yet-to-be-named juice bar will join four of the existing CH establishments in the city’s East Village neighborhood (Noble Experiment, Neighborhood, El Dorado, and the new CH concept located next to Petco Park opening this summer). With the new shop, CH Projects will veer away from the typical earthy, “granola” juice bar aesthetic, bringing their one-of-a-kind vision to life with the help of San Diego’s brick-and-mortar guru, Paul Basil of Basil Studios. The counter service-style concept will showcase seasonal, cold-pressed concoctions, smoothies and more. With a hyper local credo, the juicery will source their organic fruits and vegetables from local purveyors who share in their sustainable practices. A commissary of sorts, the juice bar will also create an efficient space for the brand to develop housemade nut milks, orgeat, syrups and more. Fresh, organic juices are the foundation for CH’s nationally respected cocktail programs at Polite Provisions, Craft & Commerce and Noble Experiment—in addition to providing cold-pressed juice to the public, the shop will supply fresh product daily to CH’s restaurants and bars. With a proclivity for healthy living, this new juice bar is a natural progression for owners Tafazoli and Stanton. Both have witnessed first-hand the grueling effects that the bar and nightlife industry can have on one’s wellbeing. As avid juicers, the duo looks forward to launching this new healthful element of their CH brand. 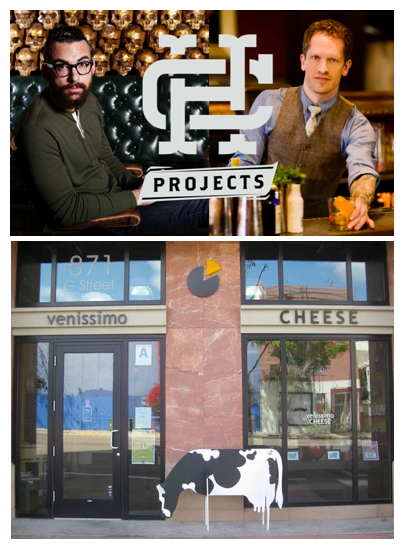 CH Projects is the visionary restaurateurs-come-social engineering duo that is pioneering the city’s now burgeoning cultural progression with eight ambitious concepts (Soon-to-come Ironside Fish & Oyster, Craft & Commerce, Neighborhood, UnderBelly, Noble Experiment, El Dorado, Polite Provisions and Soda & Swine). Co-founders Arsalun Tafazoli and Nathan Stanton have cultivated an intrinsic core philosophy—that a space should inspire, its design aesthetic and culinary /cocktail paradigm allowing for the seemingly lost art of conversation to thrive in an environment that fosters charisma, thoughtful dialogue, and the resurgence of real human interaction. In stark contrast to the overwhelming neon lights and volatile drone that emanates from plasma screens-as-art in less calculated restaurant and bar settings, CH Projects’ establishments eschew trendy, stagnant décor and menus in favor of an eclectic, contemporary quality borne out of the collaborative efforts of like-minded individuals with a hunger (and thirst) for innovation. For more information on CH Projects, visit consortiumholdings.com.